For decades the world of conventional climate research has been stuck in a groundhog day with major research overturning older ideas, but somehow the upper and lower bounds of climate sensitivity stayed the same. It’s always 1.5 – 4.5 deg C (and their models never work). Their “best” estimates of climate sensitivity are relentlessly, slowly shrinking (they were around 3.5°, now around 2°C). The new alternative model doesn’t rely on the bizarre idea that all feedbacks can only operate off the surface. The alternative model (we are going to have to come up with a better name) allows feedbacks to act differently for different warming influences, and thus energy can reroute from one outgoing “pipe” to another. The river of energy is flowing to space. If we put a rock in the way, the flow just reroutes around it. In the “…nameless..;-).” alternative model, Evans uses the same physics but better architecture and a few more empirical data points, and we can finally estimate what the true climate sensitivity must be. Because the “pipes” for outgoing radiation to space are elastic, and can adapt to increases in energy, the climate sensitivity to CO2 could be very low. Indeed it is not possible to put a lower bound on the figure — it may be almost zero. It is possible to put an upper bound on it — which is about half a degree. The most likely estimate is around 0.25°C. Empirical estimates by Lindzen and Choi, Spencer and Braswell and Idso suggest it is 0.4°C – 0.7°C. We can argue the toss between 0.25 and 0.5, but no one can argue that we need to spend a single dollar to reduce our emissions if doubling CO2 only causes minor and beneficial warming. What is striking is how small the changes need to be to compensate for “all that extra CO2″. The effect of the increased CO2 of the last few decades was neutralized if the height of the cloud tops or the water vapor emissions layer fell by just a few tens of meters. These changes are so small they are hard to detect, but there are empirical observations that suggest both may have occurred to some degree. The small changes required show just how easy it would be for the atmosphere to emit a constant energy flow, regardless of a blockage in one “pipe”. DEFINITION: The equilibrium climate sensitivity (ECS) is the surface warming ΔTS when the CO2 concentration doubles and the other drivers are unchanged. Note that the effect of CO2 is logarithmic, so each doubling or fraction thereof has the same effect on surface warming. Dr David Evans, 5 November 2015, David Evans’ Basic Climate Models Home, Intro, Previous, Next, Nomenclature. This post employs the alternative model to quantitatively analyze the climate of the last few decades, estimating the CO2 sensitivity (λC), the fraction of global warming due to increasing CO2 (μ), and the equilibrium climate sensitivity (ECS). The formulas for these quantities were derived in post 16. Here is the spreadsheet with the alternative model and the numerical calculations in this post: download (Excel, 250 KB). What is left is a simple trade-off between what are, presumably, the main influences — the change in height of the water vapor emissions layer (WVEL), and the change in CO2 concentration — on surface warming. The variables are the surface warming ΔTS, the increase in height of the WVEL ΔhW, the CO2 sensitivity λC, and the base-2 logarithm of the relative change in CO2 concentration ΔL. All the other quantities are constants whose values have been estimated. The greater the ECS, the more the WVEL must ascend to provide sufficient water vapor amplification during the doubling of CO2. Conversely, the more the WVEL ascended while the CO2 doubled, the more the water vapor amplification and the higher the ECS must be. This is the green line in Fig. 1 below. For instance if the ECS is 3.0 °C (the green cross in Fig. 1), then the WVEL ascends by ~800 m, or ~10% of its current ~8 km, during the period in which the CO2 concentration doubles — which might be from 1800 to 2080. However, the conclusion of post 17 was that the WVEL did not ascend during the period of rapid warming from 1979 to 1999, and given the pause it cannot have ascended from 1999 to 2015. Given that there was a large increase in CO2 over this 36 year period, it would appear that the WVEL descends as part of the CO2 response, that is, in response to increasing CO2 the WVEL descends, even though it ascends in response to surface warming. With ΔhW ≤ 0, by Eq. (6) the ECS cannot exceed ~1.0 °C. But an ECS of only 1.0 °C is insufficient to explain 80% of the recent warming — there has been about 0.83 °C surface warming just from 1900 to 2013 (HadCrut4, 5 year centered smoothing), that period saw about log2(397/296) or 42% of a CO2 doubling, so the warming due to CO2 should be 42% of the ECS or 0.42 °C due to CO2, but that only accounts for 0.42/0.83 or 51% of the observed warming, well short of the supposed 80%. Therefore μ must be lower. so if the WVEL has not ascended then the ECS is constrained to be less than 0.8°C, which is still not enough to explain 50% of the recent warming. And so on, as the proposed solution works it way down and left from the green cross towards the orange and red crosses in Figure 1. Figure 1: For a given warming-causation-fraction μ, the ECS is linear in the WVEL ascent (Eq. (5)). The green cross marks the center of the IPCC position (AR5); the red and orange crosses mark the approximate position of this post (estimated below). If the WVEL is not ascending because the WVEL descends due to the CO2 response (post 17), then the ECS must be less than 1.2 °C even if all the recent warming is due to increasing CO2 (μ =1) — but an ECS of 1.2 °C is insufficient to explain all of the recent warming, so μ < 1. Table 1: Simple-case scenarios. The A and B scenarios match the period of radiosonde data back to 1973 (more reliable) and 1948 (less reliable), during which the radiosondes indicate the WVEL did not ascend: the effect of several values of WVEL ascent are shown. Surface warming averages UAH and HadCrut4, both 5-year smoothed. CO2 from Mauna Loa (Law Dome prior to 1959). Details and more scenarios in the spreadsheet. The estimate of ECS for the period of more reliable radiosonde data, from 1973, is 0.5 °C if the WVEL stayed at the same height (A1). 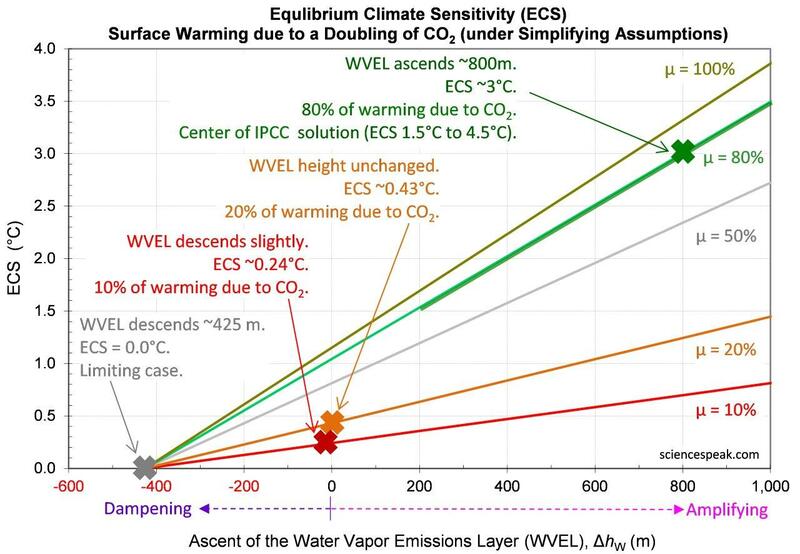 But if the WVEL ascended 25 m the ECS would have to be 0.96 °C (A2), while if the WVEL fell 25 m then the ECS must be less than 0.1°C (A3)– which demonstrates how important the WVEL is to climate sensitivity. In the last few decades, CO2 has been steadily increasing, while temperature moved around. Our emission-layer data is not good enough to track OLR, so a range of ECS estimates is unavoidable. However the radiosondes point to a slightly falling WVEL, which unambiguously implies that the ECS is much lower than conventionally believed and that the rising CO2 concentration was not the main factor warming the surface. The full case uses climate data from recent decades in Eq.s (5), (6), and (7) of post 16 to estimate the CO2 sensitivity λC, the fraction of warming due to CO2 μ, and the ECS. The climate data is insufficient to form good estimates, but is sufficient to draw interesting conclusions. The data concerning the climate parameters are considered below, and then various combinations of parameter values are evaluated in several scenarios. Davies and Molloy (2012)  report a decrease in the global effective height of cloud tops from March 2000 to February 2010, using the Multiangle Imaging SpectroRadiometer (MISR) on the Terra satellite. The linear trend was of −44 ± 22 m/decade; the difference between the first and last years was −31 ± 11 m. The annual mean height is measured with a sampling error of 8 m. Detected regional height anomalies correlate well with changes in the Southern Oscillation Index. 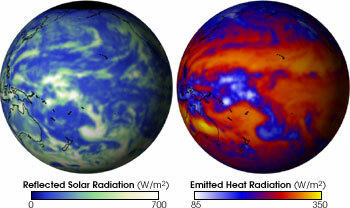 However Evan and Norris (2012) claim that the decrease reported by the MISR is an artifact due to a systematic reduction in the number of retrievals of clouds at lower elevations during the early years of the MISR mission, apparently due to “satellite orbit inclination maneuvers” causing “erroneous co-registration of the nine MISR cameras”. But they also note that “there is no obvious reason why the camera co-registration issues should affect cloud height retrievals at one height in the atmosphere more or less strongly than retrievals at another height in the atmosphere.” Using a post-hoc method for removing the bias, they report an ascending trend of +54 m/decade, which agrees with the MODIS-Terra data showing increasing cloud height of +61 m/decade. The MODIS-Terra cloud height data is of distinctly lesser quality than the MISR for measuring cloud top height; both begin in 2000. There does not appear to be any other cloud height data of note. Unfortunately the cloud height data is conflicted, and is after the period of warming from the 1970s to the 1990s. We explore both ascending and descending cloud-top scenarios below. The published radiosonde data on lapse rate trends only seems to extend to 700 hPa. Behavior in the upper troposphere might be quite different (Fig. 4 of post 17). Gaffen et. al. (2000) report that observed surface-to-700-hPa lapse rates fluctuated less than 1.5% either way about an average value from 1960 to 1998, and there might have been no overall trend (the trend might have decreased from 1960 to 1979 then increased from 1979 to 1998). To apply this in the alternative model, we assume the lapse rate only changes in the lower troposphere, in line with the radiosonde data: the increase in OLR due to lapse rate changes is estimated to be gpartialΔΓ. The International Satellite Cloud Climatology Project indicates that the cloud fraction rose by ~2% from 1984 to 1987, then fell ~4% to 2000, and then rose ~0.5% to 2010. Marchand (2012)  reports cloud fraction from 2001 to 2011 as measured by MISR rising ~0.1% and by MODIS-Terra and MODIS-Aqua rising ~0.3%. The total change from 1984 to 2010 was ~−1.5% according to the ISCCP but that is exaggerated by a factor of 2 to 4 by comparison to MISR and MODIS over 2001 to 2011, so perhaps the cloud fraction fell by ~0.5% from 1984 to 2011. There does not seem to be prior data. Table 2 shows several scenarios. In any scenario, the CO2 sensitivity λC, the fraction of global warming caused by CO2 μ, and the ECS must all be positive, which constrains the input values. Table 2: Full-case scenarios. As per Tbl. 1. The C scenarios are for the period of cloud-top height data. The C scenarios are for 2000 to 2010, where we have cloud-top height data (though the period is very short for a model that simulates transitions between steady states). Suppose the WVEL remained at the same height. If the cloud tops descended between 42 and 20 m as per the MISR observations, the ECS is likely between 0.7 and 1.4 °C, and μ is from 125% to 250% (C1, C2). But if the cloud tops ascended between 54 and 61 m in line with the MODIS observations, then the ECS is ~3.8 °C and μ is ~650% (so high because the CO2 warming is much larger than the warming that actually occurred, which requires the existence of an unknown cooling influence that does not affect ASR) (C3, C4). The unrealistically high values of μ suggest that the cloud-tops more likely descended than ascended and that the MISR observations are more likely to be correct. If the WVEL descended then estimates of μ and ECS decrease: a MISR-average cloud-top descent of 31 m and a WVEL descent of 18 m requires an ECS of zero (C5). A WVEL descent of ~50 m is required to bring μ down to ~100% if the cloud tops rose ~50 m (C6). In the A scenarios with the better radiosonde data from 1973 to 2011, there is cloud fraction data from 1984, but no cloud top height data before 2000. If the cloud tops do not ascend (in line with their probable behavior after 2000), the WVEL does not ascend (as per the radiosondes), and the cloud fraction change was ~−0.5% (in line with observations from 1984), then the ECS estimate is negative (A4). The ECS must be positive, so this indicates that on the basis of the most likely changes the ECS is very small, putting no lower bound on the estimate. Perhaps the pre-satellite warming and the cloud fraction change were exaggerated two-fold: this would increase μ to ~4% and the ECS estimate to ~0.07 °C (A5). Even if the cloud tops ascended 100 m (twice the MODIS figures for 2000 to 2010), and the WVEL descended 25 m, is ~0.03, μ is ~5% and the ECS is ~0.1 °C (A6). If the cloud tops rose by 200 m (difficult to reconcile with the MISR observations, particularly as the clouds tops average only ~3.3 km) and the WVEL did not change, estimates approach the conventional: μ ~76% and ECS ~1.6 °C (A7). The longest scenarios are the B scenarios, back to 1948 but with less-reliable or missing data. If the WVEL and cloud tops remained at the same heights, and cloud fraction changed by ~−0.5% (the net change observed from 1984 to 2011), then λC is ~0.07, μ is ~18%, and the ECS is ~0.27 °C (B4). The ECS might be almost zero, is likely less than 0.25 °C, and most likely less than 0.5 °C. The fraction of global warming caused by increasing CO2 in recent decades, μ,is likely less than 20%. The CO2 sensitivity, λC, is likely less than 0.15 °C W−1 m2 (less than a third of the solar sensitivity). Given a descending WVEL, it is difficult to construct a scenario consistent with the observed data in which the influence of CO2 is greater than this. [6^] Davies, R., & Molloy, M. (2012). Global cloud height fluctuations measured by MISR on Terra from 2000 to 2010. Geophysical Research Letters, L03701. [7^] Evan, A. T., & Norris, J. R. (2012). On global changes in effective cloud height. Geophysical Research Letters, 39, L19710. [8^] Gaffen, D. J., Santer, B. D., Boyle, J. S., Christy, J. R., Graham, N. E., & Ross, R. J. (2000). Multidecadal Changes in the Vertical Temperature Structure of the Tropical Troposphere. Science, Vol 287, 1242-1245. [9^] Marchand, R. (2012). Trends in ISCCP, MISR, and MODIS cloud-top-height and optical-depth histograms. J. Geophys. Res. Atmos., 118, doi:10.1002/jgrd.50207.